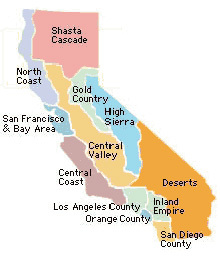 The Central Coast runs along the coast of the Pacific Ocean (between the San Francisco Bay Area on the north and Los Angeles County on the south), the Central Coast Region has both urban and rural attractions and is one of California's most beautiful regions. You'll find thriving agricultural areas; world-famous views and scenery along the coast; national and State Parks; wildlife refuges; and spectacular beaches. There are many opportunities for sailing, kayaking, surfing and other water sports.